Intex Comfort Plush Elevated Dura-Beam Airbed Just $34.99! Was $80! 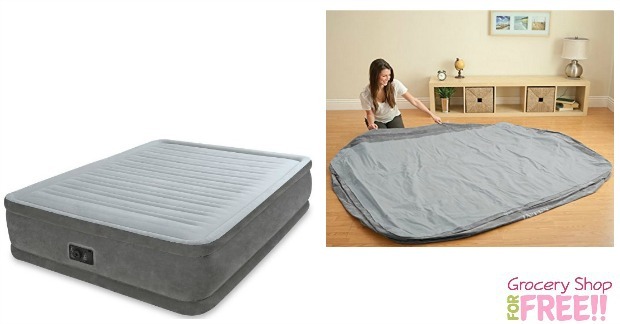 You are here: Home / Great Deals / Amazon Deals / Intex Comfort Plush Elevated Dura-Beam Airbed Just $34.99! Was $80! This is another great deal! You can get this Intex Comfort Plush Elevated Dura-Beam Airbed for just $34.99 – it was $80! The Comfort Plush Elevated Airbed is a part of the Dura-Beam series of airbeds that are providing amazing durability for years of lasting comfort. The secret is in the Fiber-Tech beam construction, which is comprised of thousands of high-strength polyester fibers that provide enhanced comfort, stability and support. Each bed is covered in plush flocking that is soft to the touch, and the horizontal air chambers provide added stability and support around the entire bed. The mattress is also equipped with a quality-tested, 20.8-gauge waterproof flocked top with 15-gauge vinyl beams and 16-gauge sides and bottom for durability. And best of all, the Comfort Plush mattress is remarkably easy to inflate thanks to the built-in, high-powered electric pump, which does its job in a mere 3-1/2 minutes. No more fussing with tiring hand or foot pumps or rummaging through the garage for your detached electric pump. And should the mattress feel a little too soft or firm, you can customize the comfort level with the touch of a button. The Comfort Plush is raised 18 inches from the floor, making it far taller than most inflatable mattresses. And at 60 by 18 by 80 inches (W x H x L), the mattress is an official queen size, making it a good fit for fitted sheets. The Comfort Plush Queen bed–which offers a capacity of 600 pounds–is a terrific choice whether you’re sleeping at the in-law’s overcrowded house or setting up a guest bed in the basement. The mattress comes with an AC power cord and a duffel bag (for storage).